Classic Red Tart Cherry Compote is a delicious homemade fruit compote made in about five minutes on the stovetop. 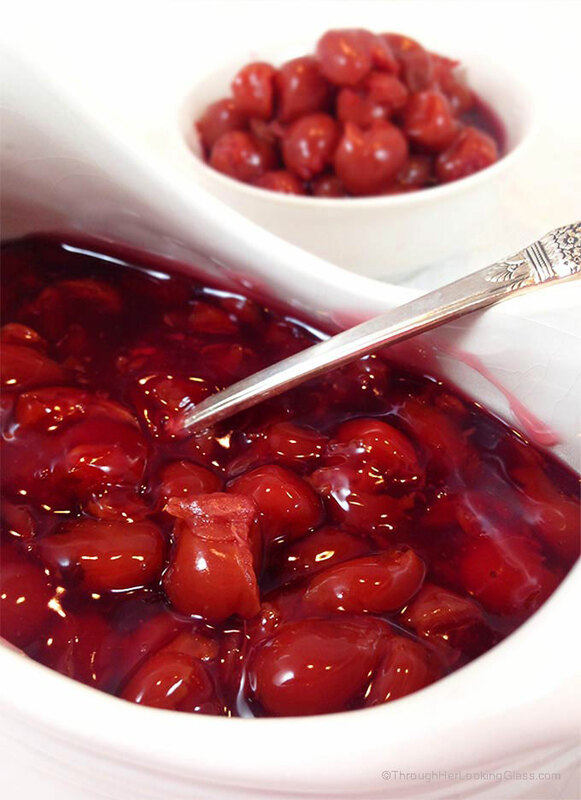 Classic Red Tart Cherry Compote is used as a mouthwatering topping on many sweet and savory dishes: ice cream, pork, ham, duck, pound cake, cheesecake, pie and yogurt to name a few. Or savor by the delicious spoonful. I’ve always thought you’re either a cherry person. Or you’re not. No in between. Because who could be ambivalent about cherries? 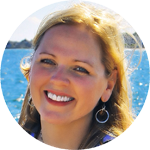 Then I talk to my Jon (husband of twenty-five years) about that this afternoon and he bursts that bubble in a hurry. 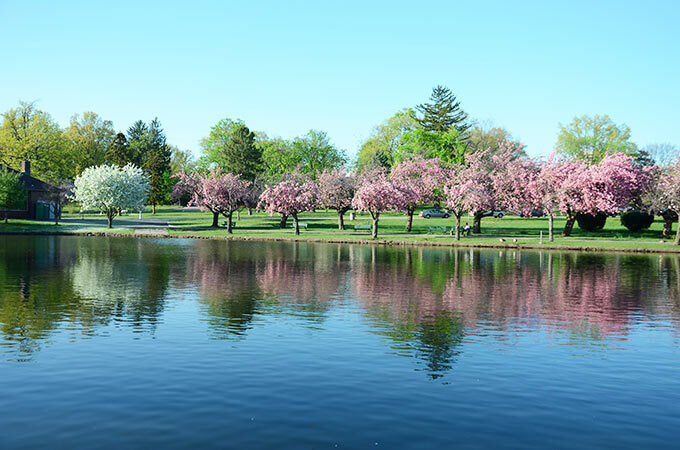 Have you ever visited Washington D.C. at cherry blossom time? I haven’t, but they say it’s absolutely breath taking. It’s on my bucket list. That and a million other things. I was in Michigan with girlfriends one year during cherry harvest though, and it was the perfect time to visit. I think we consumed our weight in cherries! We also visited the amazing store Cherry Republic, which has everything imaginable made from cherries. Cherry Pie, cherry wine, cherry soda, dried cherries, cherry salsa, cherry jam, cherry barbecue sauce. Seriously, the list goes on and on. Everything made of cherries. Cherry heaven! I bought the pewter cherry wine stopper above on that fun trip, one of my favorite souvenirs ever. But my favorite way to enjoy this Classic Red Tart Cherry Compote? Cascading down a scoop of vanilla bean ice cream. Delicious. 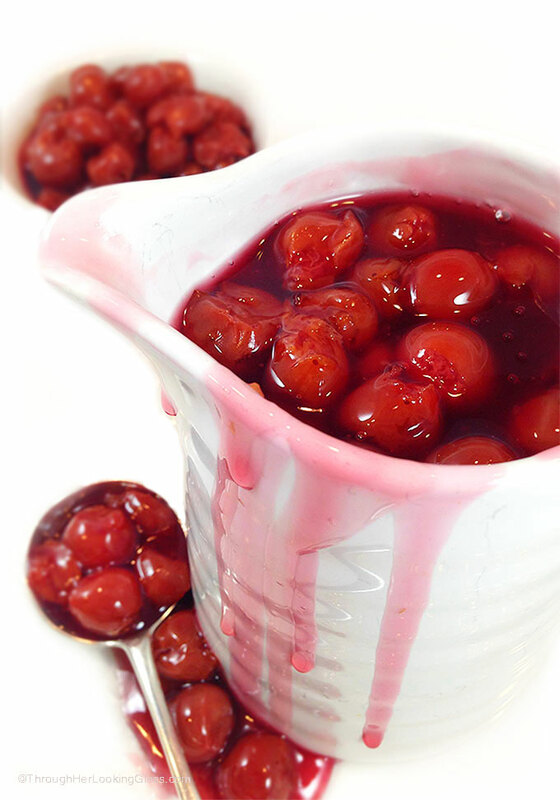 Delicious tart cherry sauce to use on ham, pork, cake, ice cream, yogurt, etc. If you're a cherry lover, you'll love this cherry compote. In a small sauce pan, mix together the sugar, cornstarch and dash of salt. Stir in the can of undrained tart cherries, lemon juice and 1/4 cup water. Stir very gently over medium heat until sauce thickens. Use warm or cool and refrigerate. I love cherries and this looks SO good! I see cherries as quite the treat...ice cream just wouldn't be the same without them. I'm ashamed to say I've never been to DC for the cherry blossoms. I'm only a couple of hours away. I'll have to make that trip one day! Yum.... I agree. Cherries are delicious and there can never be too many cherries!!! This looks delicious. Viewing the cherry blossoms is on my bucket list too. ???? I think a little on my oatmeal right now would be amazing! I love cherries! This compote looks so yummy! Growing up, my birthday request was always Cheesecake with cherry topping. This makes me crave that so bad! I love cherries! This compote would be good on so many things! Allie, I hate to say this, but I gotta agree with your hubs, when it comes to cherries, I, too, can take 'em or leave 'em! Take em definitely when they are in this compote form or pie or scones or cake or dried form - but fresh cherries...hmmm...yeah...no...I'll just send em to you and you can send me back a small jar of this? :) Those cherry blossoms look so gorgeous BTW! Only 5 minutes? This glorious compote needs to happen at my house! YUMMMMMMMMMMMMMMMMMM. I also LOVE cherries - can't wait to try this one. It looks too easy to be true but I'll believe you :-) Thanks! Thanks Carolyn, glad to hear you're a cherry lover too. Cherry lovers unite! 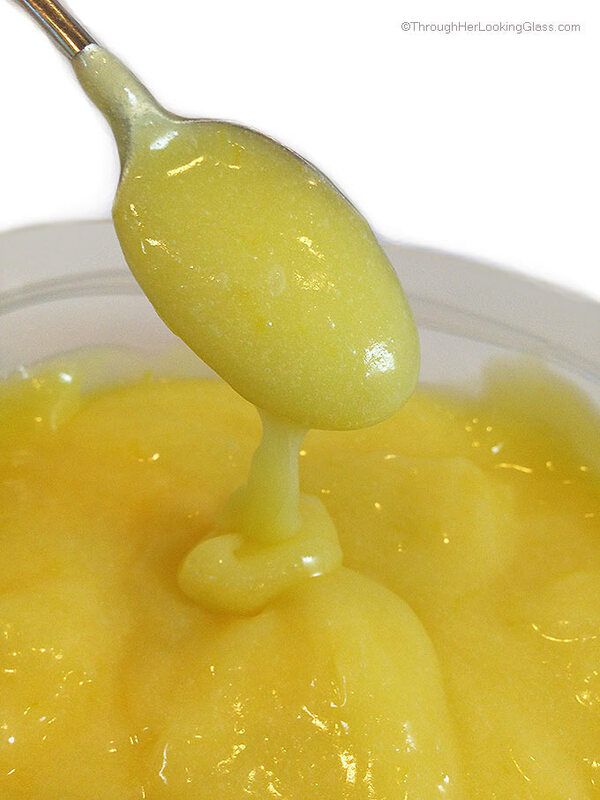 Hope you enjoy this compote. This looks soooo good! Am definitely a cherry girl! This does look super easy and delicious! We love cherries at my house! I love all of your suggested ways to use them! ?? I LOVE anything made with cherries. 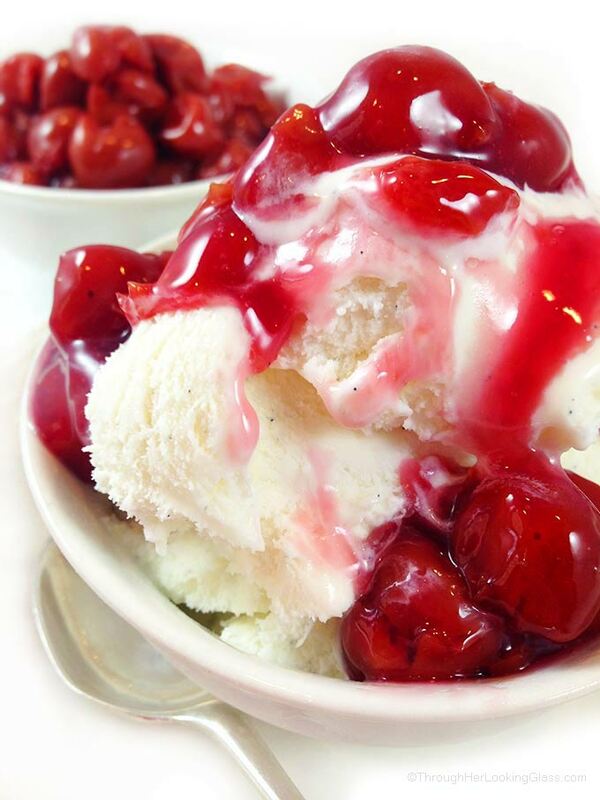 That shot of the cherry sauce on the ice cream is calling my name. Yummmm! This is such a great recipe, because unlike store-bought cherry pie filling, yours has no corn syrup and red dye! I don't think many people realize how easy it is to make something from scratch that tastes better and is better for you! Hi Cynthia, your comment is so interesting. I had to go to three, yes THREE grocery stores to find canned tart red cherries that weren't packed in heavy corn syrup. I just wanted them in water. This is such an easy recipe and takes so little time! I LOVE cherries. Jac is like Jon--could take 'em or leave 'em. Maybe it's a guy thing. ;) I'll tell you what--I can't wait to try this recipe just like you pictured...over a bowl of vanilla bean ice cream. Yummm! Hope you guys enjoy this Susie, super easy! THAT drizzled over ice cream is HEAVEN on earth!! I'll take 'em! That looks absolutely amazing and I can think of a gazillion different ways to use them! Your picture is droolworthy! I love all kinds of cherries but tart cherries are my absolute favorite. I have a HUGE bag of them in the freezer and put them in everything I possibly can. This compote is SO calling my name! We lived in Michigan for 10 years before we transferred to CT and I agree, they have the best cherries. We often visited Traverse City, the cherry capital and we love that place. Good to know you had a lovely time there! 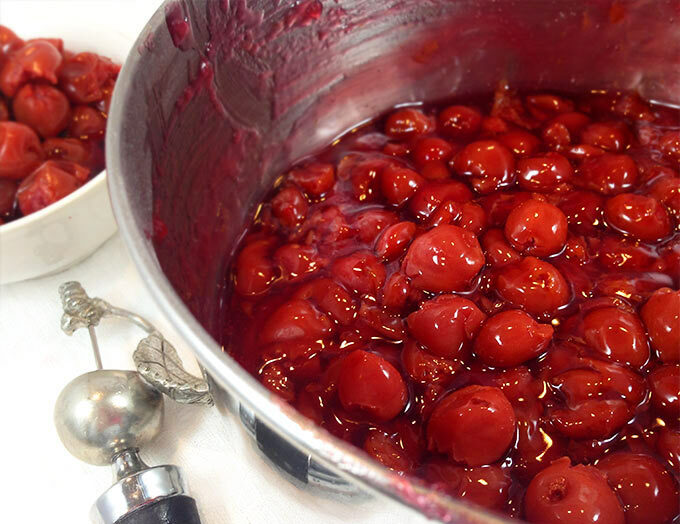 This cherry compote is not only summer-perfect but truly fruity-licious and I can just imagine so many yummy uses for this.....toppings for french toast, ice cream...etc....endless yum! I haven't eaten cherries in ages. I know how healthful the tart one's are for us. Your sauce looks scrumptious. My spoon is at the ready! I adore cherries, we have a huge tree in our garden that makes the best cherries I have ever eaten. Unfortunately not quite every year, so I am keeping my fingers crossed that we will get some this year. I could make this compote with the preserved cherries from last year, it looks so yummy! Sounds delicious!!! How wonderful to have your very own cherry tree!!! I would be in that tree too! Thanks for your recipe! I'll try it soon. I think that is a kind of a good thing for an autumn time. This looks outstanding. I will be making this tonight to put on cream cheese crepes in the morning for our annual church brunch. Cream cheese crepes? How delicious ?. Merry Christmas! Look out! I think you overfilled that pitcher! This looks so good~ Can't wait to try it. I'm a cherry lover like yourself and I say yes to making your compote. Fantastic photos by the way. I have fresh tart cherries, can I use them in place of canned? And do I need to substitute anything?? Hi Annisa - Lucky you - fresh tart cherries, yum! Yes, you can easily use fresh. You may want to cook it over the heat for just a couple minutes longer to soften the cherries a bit more. (The canned ones will already be soft.) Thanks so much for dropping by and enjoy! Hello I am so grateful I found your weblog, I really found you by accident, while I was browsing on Aol for something else, Anyhow I am here now and would just like to say many thanks for a incredible post and a all round interesting blog (I also love the theme/design), I don't have time to look over it all at the moment but I have book-marked it and also included your RSS feeds, so when I have time I will be back to read a lot more, Please do keep up the awesome job.